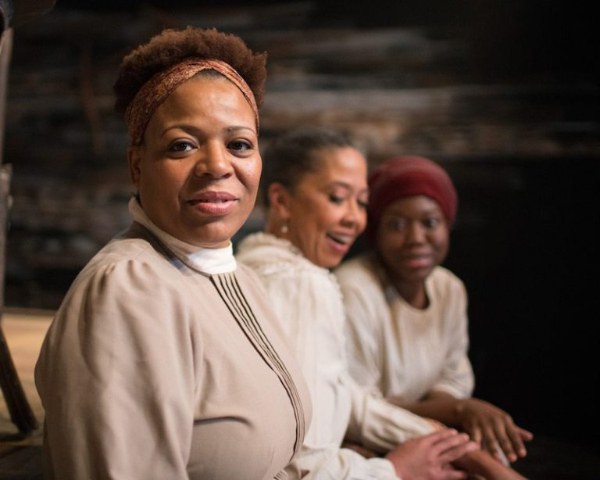 Lisa McConnell as Lula, Susan Anderson as Fannie, and Myesha-Tiara as Mattie. Photos by Joe Mazza, BraveLux Photography. 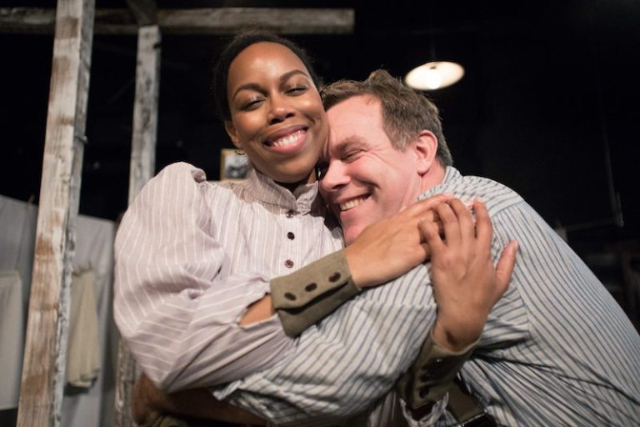 Wedding Band: A Love/Hate Story in Black and White is a powerful drama of black-white relations in 1918 South Carolina, soulfully directed by Cecile Keenan at the Artistic Home. The 1966 play, written by Alice Childress, a prolific if little-known African-American playwright, has passion and relevance for a modern audience. A quartet of talented actresses creates the atmosphere in which the tale unfolds. Fannie (Susan Anderson), a woman of substance and property, believes she’s “representin’ her race in a approved manner.” She owns the house in which the other three women live: Single-mother Mattie (Myesha-Tiara) lives with her daughter Teeta (Maya Hooks); Julia (Raina Lynn), a town girl who has come to live in the country; and Lula (Lisa McConnell), a religious woman who takes every opportunity to launch into a hymn or kneel in prayer. Lula’s son, Nelson (Kevin Patterson) is a soldier home on leave, looking for a little fun. By the end of the play, he shines his boots and dons his full uniform to go back into battle, just a few months before the armistice of November 2018. Mattie receives a letter from her common law husband, who is on board a Merchant Marine ship. Eager to hear what he says, Mattie asks Julia, who went to school until 8th grade, to read it to her. The central story revolves around Julia’s 10-year relationship with a German baker named Herman (Scott Westerman). (They could not marry because of laws against interracial marriage, which only ended with the Loving vs. Virginia decision in 1967.) Both Germans and African-Americans were subject to abuse and discrimination in 1918, of course, but the idea of a white man “keeping company” with a black woman rouses the considerable ire of the community—and especially of Herman’s mother, played forcefully by Donna McGough. When Herman comes down with influenza while visiting Julia, the family tension comes to a head. Herman’s sister, Annabelle (Laura Coleman), tries to intercede and mollify her mother, to no avail. The women hold kerchiefs over their faces while they are around the ailing Herman. People were terrified of the flu in 1918; it was highly contagious and became an influenza pandemic that killed millions of people around the world. Keenan’s direction and a solid cast result in a strong ensemble production. Kevin Rolfs’ scenic design creates a weather-beaten wooden frame for the house where the four women live. Costumes are designed by Zach Wagner. Alice Childress was an accomplished actor in off-Broadway plays before beginning her writing career. Her work includes ten plays and five novels. Her 1952 play, Gold Through the Trees, was the first play with Equity actors produced by a black woman. She was also one of the first black women to direct an off-Broadway play. One of her young adult novels, A Hero Ain’t Nothin’ But a Sandwich, also became a 1978 feature film of the same title. Her 1979 novel, A Short Walk, was nominated for a Pulitzer Prize. After premiering at the University of Michigan in 1966, Wedding Band was staged in Chicago in 1972 for a six-week run at the Ivanhoe Theater. After that, the play opened in New York at the Public Theater with Ruby Dee and James Broderick starring as Julia and Herman. Wedding Band: A Love/Hate Story in Black and White runs 2.5 hours with one intermission. See it through December 17 at the Artistic Home, 1376 W. Grand Ave. Performances are Thursday-Sunday. Buy tickets for $28-32 online or by calling 866-811-4111. Posted with permission of Third Coast Review.